I often wonder what the Shakers would create from this post-modern situation of over-consumption, and dwindling resources. I do know their solutions would employ an economical use of local materials and local people while focusing on simplicity and utility. 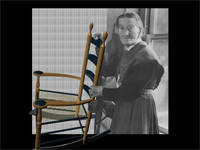 I am not sure the Shakers would use plastic but I do think if their work and communities were thriving today they would do something wonderful with their scrap materials. 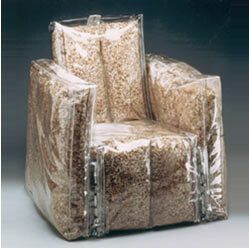 This chair is a plastic bag filled with woodchips. It is a wonderful feeling to build something from a pile of stuff. She says..."use your resources wisely, support your neighbors and community.